July 24: A baby orca whale is being pushed by her mother after being born off the Canada coast near Victoria, British Columbia. 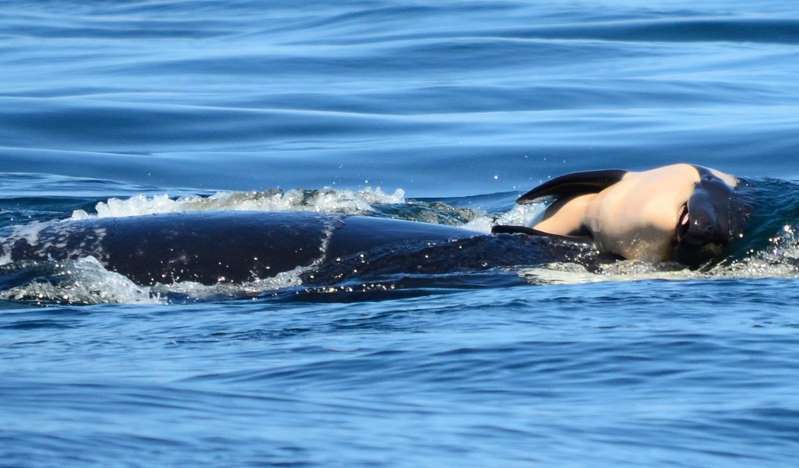 A mourning orca whale continued to carry her dead calf for a fifth straight day on Saturday, which is a rare occurrence in nature and is believed to be grieving. Since then, she's been carrying the calf's body around on her nose, diving to pick it up again when it falls off. She was last sighted in the early evening on Saturday in Canadian waters. Scientists have documented grieving behavior in other animals with close social bonds in small, tightly knit groups, observed carrying newborns that did not survive. The baby orca was the first calf born in three years to the endangered orcas, the Center for Whale Research said. But more than 24 hours of grieving is a rare occurance, says Deborah Giles, research scientist for University of Washington Center for Conservation Biology and research director for the nonprofit Wild Orca. "It is horrible. This is an animal that is a sentient being," Giles told The AP. "It understands the social bonds that it has with the rest of its family members. She carried the calf in her womb from 17 to 18 months, she is bonded to it and she doesn't want to let it go. It is that simple. She is grieving." J35's news came just as researchers were also tracking a 4-year-old in the southern residents that is emaciated, and whose survival may be in doubt due to loss of body fat. The most recent census of the orcas has found that they number just 75 in the area, across three southern resident pods. For the last three years there have been no new calfs born to the shrinking killer whales in the Pacific Northwest.